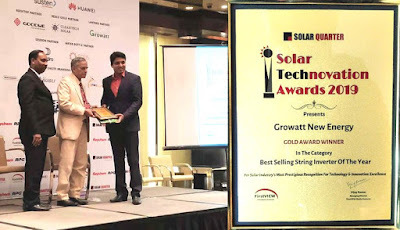 On March 7, Growatt was awarded "Best Selling String Inverter of the Year" in New Delhi, India. The award recognizes Growatt's development progress in the Indian rooftop sector. As the Global TOP 10 Solar Inverter, according to IHS Markit, and the No.1 Chinese Residential Solar Inverter Brand, Growatt has consolidated its technology, product and service advantages to favor its business expansion in India. Shantanu Sirsath, Growatt's Technical Manager, introduced this most up-to-date inverter, "At first glance, people may say this is a cool looking inverter, but what's really cool is its design and technology. MAX has more smart functions because it uses premium components and is designed with powerful quad-core architecture. With all these, MAX has got functions, such as One-Click Diagnosis, Fault Waveform Record, Smart I/V Diagnosis etc. These are very convenient and powerful tools for monitoring and troubleshooting. As we summarize in one word, MAX is smart and powerful!"